try the scenario and you will get more information about the effect. if you don't do that,the first arrow or other throwing object shoot in the game will get the id -2,so every order will be sent to this object,so the effect will break down. ha ha .to be honest,that's not my own work.i only solved the view of the units,by using the old-exeplorer.thanks to my mates' imagination. yes,i wanted to share it for a long time. This is great. It would be even better if you explained how to do this, though. I tried to duplicate it, and I can't. You can request a review by going to the AoKH Scenario Design and Modding forum, look for the Sticky thread near the top about Review Requests. This utility shows you how to create a spy or assassin unit by controlling another players unit. The idea is great and it works fairly well, but it has a lot of limitations. First, you can only select the unit through ',' key, and that also centers the field of view n where the unit originally was ( as the unit is treated as an arrow ). Second, you can't attack with the unit ( either own or enemies ). 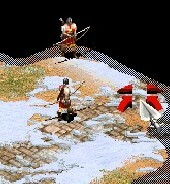 Finally, the vision of the unit is tiny, being provided by an old-explorer unit ( which btw is not mentioned ). Also, the instructions are not clear at all. I know that there are some translation problems, but man, this is hard to reproduce. I think this trick could be useful in a scenario where you are a spy wandering around in an enemy town. But the same thing could really be accomplished by having the enemy town as an ally and then changing diplomacy when the assassination ( or whatever ) is about to happen. The most useful thing in this utility is that the COLOR of the unit is the same as that of the enemy, making for a more convincing 'spy' effect. It's good, but needs improvements and I don't think the effort to make it is worth it.